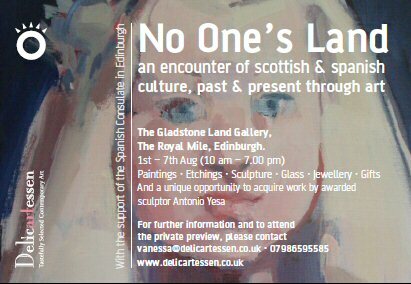 This is the newsletter sent to our clients on the event of our annual exhibition at the Gladstone Land Gallery, in the Royal Mile. For the second year in a row, Delicartessen secured funding from the Spanish Consulate in Edinburgh to celebrate an encounter of Spanish and Scottish art. The exhibition was, after conclusion of the week, transferred to Joseph Pearces, our regular venue, in Elm Row, as part of our Edinburgh Festival exhibition 2011, where it would stay until mid September. The Gladstone Land Gallery, The Royal Mile. Edinburgh. 1st -8th August 2011. 10 am till 7 pm. A few months ago I attended a conference by Marjorie Trusted from the V&A Museum in London, organised by the Spanish Consulate in Edinburgh. It explored the fascination of Picasso for Velazquez and his painting of “Las Meninas” (which Velázquez had originally painted in 1656 and Picasso would reinterpret 300 years later). The talk highlighted Picasso’s motto that in art, little is original or new, and it provided renewed inspiration for this exhibition, which pays tribute to the circularity of cultural iconography; where symbols and images are repeatedly recycled over time. Picasso was, in his days, accused of being “all over the place”; a “chameleon” absorbing other artist’s influences and styles but lacking his own. But he would argue that this need for belonging to a movement or school was limiting. His rootless nature was probably related to an emotional “middle place” too: where he felt quite alienated from his country of origin as the authoritative regime took its course in Spain; yet still a foreigner in his adoptive and beloved France. No sense of belonging here or there. In No One’s Land. He affirmed that “art is the elimination of the unnecessary” and in his search for simplicity he kept reducing reality, emptying the superfluous and transcending the idea of belonging to achieve universality. “No One’s Land” echoes themes of land and identity and therefore, we present representations of the artists’ immediate realities. Yet, even when differences emerge (i.e. Highland cows as opposed to bulls) the common nature of the themes that arise among both Scottish and Spanish artists, the new reinterpretations of classical themes: (i.e. Las Meninas, still being revisited by artists near and afar); reaffirms this idea of “no one’s land” or, if you prefer, “common land”, in the sense that the relevant human emotions and reflections that fuel the arts inscribe in a universal language. A language that Picasso spoke loudly and clearly. And which still resonates to this day. With the support of the Spanish Consulate in Edinburgh, Tapa Restaurants and the Council of Alhaurin, Malaga. Click here to download a pdf version of the printed catalogue.